Google+ Mars Travel: McLaughlin Crater - A Once Lively Lake? McLaughlin Crater - A Once Lively Lake? 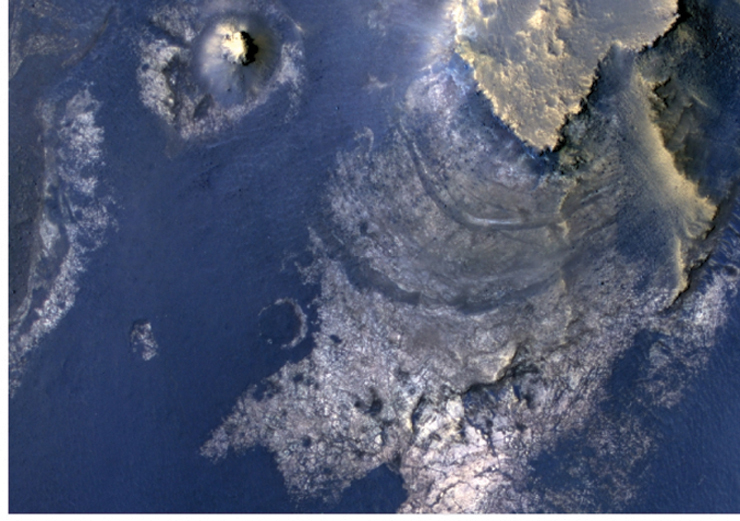 McLaughlin Crater on Mars may have once been home to a massive lake! That's according to new spectrometer date from NASA's Mars Reconnaissance Orbiter (MRO). McLaughlin is a 92 kilometers (57 miles) in diameter and 2.2 kilometers (1.4 miles) deep. The crater's extreme depth tapped into typically unexposed underground channels of water, which then filled the crater. MRO discovered clays and carbonates, which only form in the presence of water, on the floor of McLaughlin Crater. We know small underground channels fed this massive lake because there is no evidence of any large outflow channels leading into the crater. Additionally, small channels within the crater end at a certain point on the crater wall, which was likely the level of of the lake. This new discovery of clays and carbonates in McLaughlin Crater has added even more hope that life once, or maybe still does, exist on Mars. The presence of carbonates in particular indicates that the lake likely had low-acid content because carbonates generally do not remain preserved in high-acid environments. Life as we know is most likely to exist in low-acid environments, so having this knowledge makes scientists think this crater and the underground tributary channels may be the ideal place to search for evidence of past and/or present life.